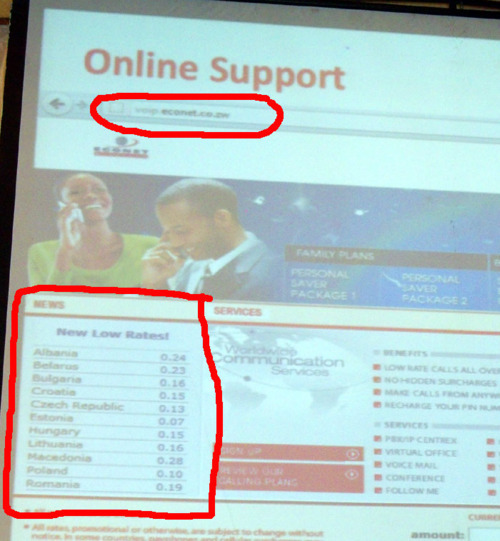 Last week, after we attended the Econet VoIP launch we discovered that the product’s web platform, voip.econet.co.zw, was basically not ready for public viewing. This despite the fact that they told us about the web platform and made the website address very clear for everyone to see at the launch event. But still, we thought maybe it had probably been a crazy day for the web team at Econet and they’d get around to fixing it over night or the next day. So we let it slide. It’s been a whole week and the site is still not fixed! Links still don’t work, and if you check out the pages they are hiding from users (by making links not work), you see the pages still contain default SysMaster (their supplier) information. Below is an article this writer posted on a personal blog about the issue. 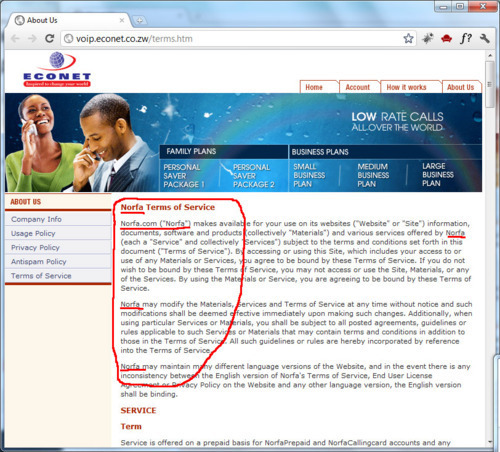 We’re publishing it here in the hope that someone at Econet will get the website fixed. As any guy would do I checked the website for any information we were not getting from the presenter, and sure enough the tariffs were on the website. I tweeted the web address to the Techzim followers so they too could find more details about the new service. By this time I had already seen tweets that the website was quite broken so I accepted that this wasn’t ready for viewing yet and the guys were fixing stuff. Advised readers the same. 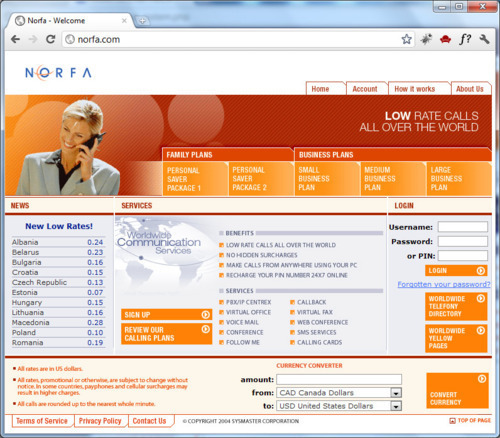 Googled the company and saw that it offers VoIP Billing, Gateways and other stuff. Kinda made sense then that Econet bought the VoIP system from SysMaster and they forgot to change this. The forgetting doesn’t make sense, it’s the “why SysMaster” that does. 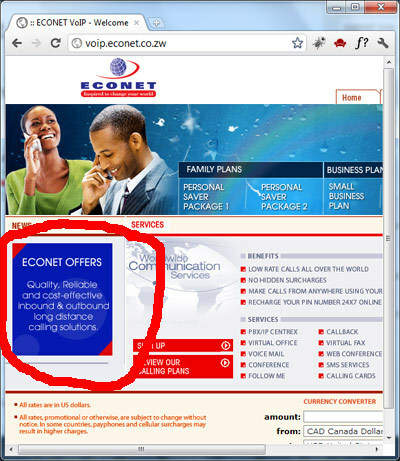 The point is that Econet VoIP launched today in the morning and they made the web address very visible during the presentation of the new product even though they knew the platform wasn’t ready yet. The point is that if the web admin guy/girl at Econet was able to take down the tariffs quickly when we disclosed the web address on Twitter, how is he/she failing to just go in there and remove the default pages that come with the system? The main point here is: how under the sun do you launch a product, one of whose main points of interface with customers is the web, without having the web platform ready? Doesn’t make any sense. If you find the group full, please notify us on +263 715 071 199 and we'll update the link. sheer complacency. this will be Econet’s sucker punch soon enough if they do not pull up their socks. Watch out for these silent underdogs. Believe it or not they offer some better service than Econet. Shows you, for some, websites are just nice to have’s…they don’t think we actually check them…. they could have even done a one pager website…tht won’t even take a whole day! One wee?? ?Come ooo-ooooonnnn!!!! 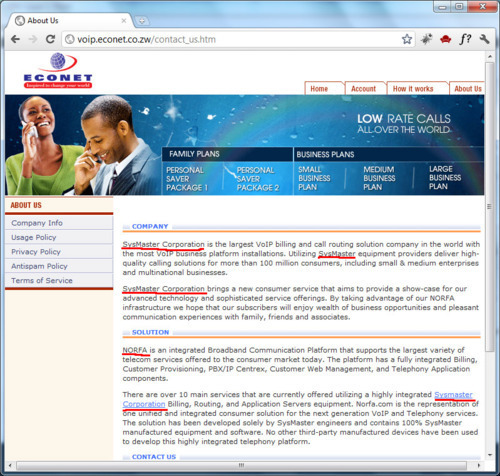 Econetsi….getting to big for its boots! Too bad even big companies like Econet are doing this. I think their marketing is good but they will not deliver. Same with when they launched Ecocash, I remember going to one shop to open my Ecocash account. I filled in the form and I wanted to make the initial deposit then the lady told me that currently they cannot do the cash in transaction I was told to go to TN bank. @7eb4f358ca52e40446d9481e822719fb:disqus i agree 100% and Zimbabwe, as a nation, needs a serious mindset change if we are to make a mark in the 21st century. hahahahah, this is ridiculous. I can’t expect this from a giant lyk Econet!!! kikikiki, so why are you hiding behind Hollywood? Thats what happens when you employ a lot of sales exec than tech engineers! mobile network and how to operate it? Heck, I say no. A big fat NO. Zimbabwean just because he is the “most literate” in Africa. say was made by a Zimbabwean. they just building joomla sites which even a O’Level can do intuitively. so-called “best education system” in Africa. outside South Africa. it does not even use a white-label solution. started from scratch with far less money. name unlike Telkom and SASOL. thing that stops me is that I do not have a telecoms license issued by Protraz. Anyway, Econet’s business model works for it. 100 companies in the world. i dont get your argument. this article is not about using a white label solution or even saying that Econet should manufacture network equipment for their own use etc.. read the headline … it says “how not to Launch an internet based product” and the focus of he article and people’s arguments are along those lines.. Econet can certainly do better than this. how do you launch a website that is half baked? one that is not complete. this is a web based solution we are talking about. in typical, ready… fire… aim fashion thats Econet for you. you do not launch a service and the primary interface to the system is down or has dead links thats a No No.. even someone who is just out of high school can tell you that. this shows you there is someone sleeping on the job. i for one am not tickled by these services.. EcoCash and even this Voip service so i leave it to those that want to consume the service but … ya Econet has to up their game.. the level of complacency shows you how one has the mentality, “If i am the leader, why should i worry”. they should go and ask Standard Chartered Bank what not to do when you are a market leader. They never, 10 years ago thought that a local bank, CBZ would be the leading bank by deposits. staff as well as developing and acquiring new competencies. BELOW TO SAY IT HAS A PATENT FOR. patents for products it developed in-house. Skype I talk about also has patents. product rather than just borrow technologies all the time. only, and not anything else the article highlights. different aspects of the same piece. people here as I comment from my own brain. in the article, or even how they feel about it. Hope it now makes sense. I’m sorry – do you expect people to actually read through that entire, uh, comment? the article is 621 words, your comment is 717. I’m not trolling, I’m genuinely amazed at how passionate you are about the subject. the article by Ken Mufuka in the current Financial Gazette. It just sums it up! Thanks Prosper! That was very informative. Ignore the negative comment. This is a free forum and everybody’s free to air their views! and it was by Edson Chikobvu whose thinking there I describe as nothing but brilliant. I have no pity for them last year when I told them they were doing it wrongly , they had no time to listen to me. they are still the leading provider and most of you use their network anyway without need to liaise with their website, whats the fuss? I don’t know what the fuss is about econet and websites. this is from a company that can’t even offer simply web solutions like giving you information on their sms centre number or trouble shoot an issue like getting the “3G” settings. Their home website doesn’t offer anything except the fanfare that is their logo. And then whats the point of having voip if the bandwidth that is supplied by Econet is not even enough to use whatsapp? Maybe one day when guys like telone (who is giving great service so far) overtake them, they will stop and rethink their strategy. thanks again for the feedback! Except where otherwise noted, content on and from this site is licensed under a Creative Commons Attribution-NonCommercial-NoDerivatives 4.0 International License.